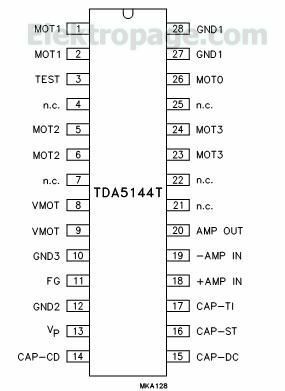 The TDA5144 is a bipolar integrated circuit used to drive 3-phase brushless DC motors in full-wave mode. The device is sensorless (saving of 3 hall-sensors) using the back-EMF sensing technique to sense the rotor position. 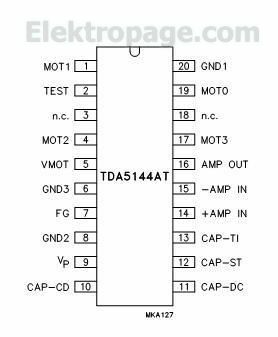 A special circuit is built-in to reduce the EMI (soft switching output stages). It is ideally suited as a drive circuit for hard disk drive spindle motor requiring powerful output stages (current limit of 2.0 A). It can also be used in e.g. laser beam printer and other applications.